One of the most beautiful islands of Greece, Amorgos is located on the southern side of the Aegean Sea. This is an authentic Cycladic island with traditional architecture, many churches and wonderful beaches. The most famous sight of Amorgos is the Monastery of Hozoviotissa, impressively constructed against a rocky mountain and offering wonderful view to the Aegean Sea. Below the monastery is the nice beach of Agia Anna with crystal waters. Amorgos is the perfect place for total relaxation, ideal for families and romantic couples. 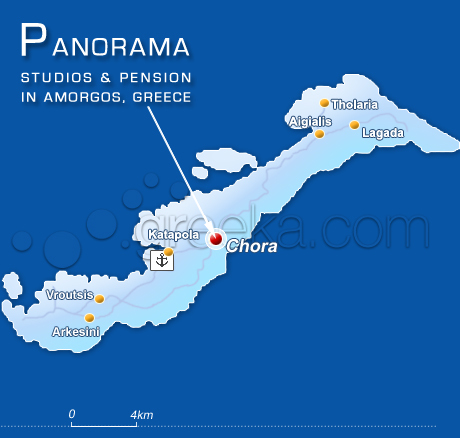 The two ports of Amorgos, Aegialis and Katapola, connect the island to Piraeus, the port of Athens, and other islands of Cyclades. ChoraChora, the picturesque capital of Amorgos, spreads on the slopes of a hill, offering great view to the island and the Aegean Sea. It distinguishes for the pure Cycladic architecture, with the sugar houses, paved streets and small churches. On one side of Chora there is the Venetian Castle, constructed on top of a huge rock, while on the other side there are some ruined windmills. Walk along the streets of Chora and feel the special vibes of the island. In the evening, Chora is the best place for a relaxing drink.